Ethan must now live as Drew Bohner—a petite blonde with an unfortunate last name—and navigate the treacherous waters of freshman year while also following the rules: Never tell anyone what you are. Never disobey the Changers Council. And never, ever fall in love with another Changer. Oh, and Drew also has to battle a creepy underground syndicate called "Abiders” (as well as the sadistic school queen bee, Chloe). And she can't even confide in her best friend Audrey, who can never know the real her, without risking both of their lives. 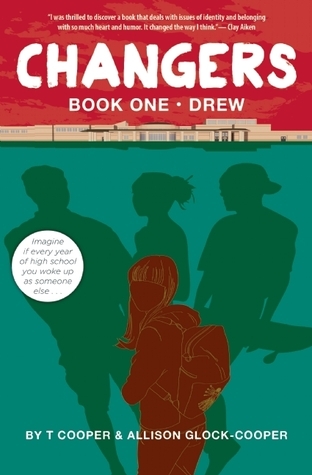 Fans of the books of John Green, the Joss Whedonverse—and empathy between humans—will find much to love in this first of a four-part series that tracks the journey of an average suburban boy who becomes an incredible young woman . . . who becomes a reluctant hero . . . who becomes the person she was meant to be. Love it. Love it, love it, love it. Seriously. Read this. I absolutely love the subject matter of this book. I think the topic is phenomenal, and it challenges the way you think about "girl" and "boy". I remember when I was pregnant with my son. I really wanted a girl and thought in the beginning that I was having a female. A few weeks before I found out, and people would ask me what I thought, I always hesitated to say. I did not want to call it a "she" in case it was actually a he and I was giving him a complex before he even entered the world. Silly, yes, but pregnant women are not the most rational beasts on the planet. I love this book because it makes you think about how society treats you, and how you treat others, based on gender. And the very best part of it all is that the lead character, Ethan-turned-Drew, is okay with it. Of course things are murky and strange at first. But as Drew navigates 9th grade, she is simultaneously attracted to her female bff and this guy she meets. And it is okay. I want my son to grow up in a world where it is okay to explore who you are, how you identify, and one where you love people based on their soul, not what is in their pants. I think a lot of teens struggle with identity, and this is a book that can make them feel better that they just don't know who they are. The authors start to bring up some social issues, though they do not go much into why the Changers exist or why the Abiders do not want them to. They also do not really explain the renegade Changers. However, it is only 9th grade, and Ethan/Drew/whoever else has a lot of time to unearth the reasons. I am absolutely looking forward to the next book and so very curious to see who Drew wakes up as in 10th grade! I strongly encourage you to pick this up. It is great... And there are no vampires. An interview with the authors, T and Allison! 1. The concept behind Changers is very unique. How did you come up with the idea? We were literally sitting on a blanket in the park talking about our then 11- and 12-year-old daughters, and how they seemed to wake up as different people day to day. And bam, just like that, we thought, what if that actually happened? We decided to take the journey all humans go through as we find our way to adulthood, the stumbling through various phases and personalities, and make it literal. We are also big believers that every person contains multitudes. That we are all a little bit of everything. And this concept allowed us to explore those themes as well. Lastly, we love a good love story. And to us, Changers is essentially about how we can love one another no matter what shape, size, gender, race, etc. we become. 2. Writing for one person is hard enough, but having two authors could be even more difficult. How did you collaborate to write this book? It was both easy and challenging. Easy because we trust each other. Difficult because we are both stubborn people used to having dominion over our words. It became an exercise in compromise. But it was also really exciting to meld our voices and see the twists and turns that came about from collaboration. There were fights. But no blood was shed. Yet. 3. I assume this will be a 4 book series. Do you have the other changes already in mind, or are you just waiting to see how things develop? We do know the other three changes that our lead will go through, and yes, it's a four-part series, one identity per year of high school. We also know who our protagonist will choose to be at the end of the series. That said, the process of writing is always a little bit magical, and that alchemy could certainly affect the end result. As with everything, you have to be open to letting the work take off on the life you've blown into it.